If you are somewhat familiar with the region then you dont need my advice on buying Champagne or any further info on the home of the bubbly, so leave now and go drink something. If you are not that familiar with Champagne then I will proceed to give you a little run down. I think this quote from Waynes World is a good place to start . . . So that gets to the point of people calling anything that sparkles, Champagne. When in reality only wines from Champagne can bear the name. If a fine sparkling wine is from California, then we classify it as just that, sparkling wine. The list of Champagne producers above are always sure bets for quality, beautifully crafted wines. They offer Non-Vintage Champagnes, Vintage Champagnes, Reserves, Roses, Prestige Cuvées, and the list goes on. The Non-Vintage offering from all these houses are their blend of grapes from different years and are the most inexpensive and consistent from year to year. The Non-Vintage will represent the house style and range from delicate and lite, to powerful and robust. Non-Vintage is a great way to go and offers up excellent wines year after year. Vintage Champagne is just what it sounds like. A pressing of grapes from one year that the Champagne house classifies as a vintage year. Only the best vintages are established as a vintage year, therefore, they are quite a bit more expensive and produced in smaller quantities. The Prestige Cuvées from these top Champagne houses are the best of the best. Best grapes from the best villages, always made from the first pressing of the grapes, aged in the bottle longer than most other offerings, made ONLY in vintage years, and priced to keep you working two jobs to afford the stuff. With names like Cristal, La Grande Dame, and Dom Perignon, we have all seen them in the glass cases at the finer wine stores. Champagnes are made in different degrees of dryness and there is something out there for everyones taste. 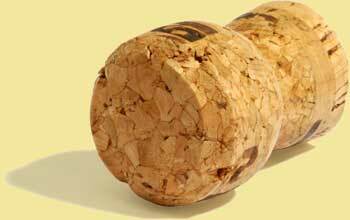 Brut seems to be the most popular and is the driest style that is produced. It has the least residual sugar and thus produces the driest style. The next driest is labeled Extra Dry, then Sec becomes sweeter, and then Demi-Sec which is even sweeter, and finally Doux, the sweetest of the group. With all of this info at your fingertips it is really only when you start to taste different Champagnes that it all starts to fall into place. That is basically the case with all wines, so I always recommend to just drink, drink and drink some more. Or if you are uptight about all that drinking, then you can call it tasting. To get those wines to sparkle the winemakers let the wine ferment a second time in the bottle and presto, sparkling wine. Actually it is not presto, it is more work than I would want to do as a winemaker, but these guys from Champagne would not have it any other way. It is called the Méthode Champenoise, and it goes a little something like this. Press the grapes and get the juice. Let it ferment. First fermentation involves as usual, the Sugar in the grape juice being converted by the enzymes in the Yeasts into Alcohol and Carbon Dioxide. Blend it. Blending of the three grapes used in Champagne. Pinot Noir, Pinot Meunier, and Chardonnay. Blending of vintages and vineyards. The winemaker will work tirelessly to bring all these still wines into a perfect blend. Add more sugar and yeast. This is called the Liqueur de Tirage, and this is added in the form of a syrupy mixture and starts the second fermentation. Second Fermentation. This takes place in the bottle and leaves the carbon dioxide no place to go so, presto, bubbles in the wine. Let bottle sit and age. Riddle it. It is called Riddling when the poor guy in charge of turning bottles, hand turns thousands of bottles just slightly while also gradually tipping them down a bit as they sit in a big rack facing at an angle downwards. The riddler does this again and again over a couple months time and eventually has the bottle almost turned all the way upside-down. All this work and some sore wrists to gradually get the sediment that is thrown off from the second fermentation down to the neck of the bottle. Get the sediment out. This is called Dégorgement, and after the bottle has it’s sediment to the neck of the bottle, actually all the way down to the temporary cap, it is dipped into a freezing brine solution and uncapped and sediment removed. Dosage. A bit more wine and cane sugar is added to the bottle and determines the dryness level of the final product. So now you can get an idea of the labor and time that goes into the wines of Champagne.